Despite the enormous number of charities in the world, more are established every year – and many also disappear. Australian Charities and Not-for-profits Commission data shows that, since 2012, 8,500 charities have been registered and more than 13,500 have been revoked. Former tennis player Pat Rafter’s Cherish the Children Foundation, which closed in 2011, is just one of many examples of a charity that has come and gone. Rafter has a long history as a philanthropist. He donated half the prizemoney from his US Open wins to the Starlight Children’s Foundation as well as starting up his own foundation in 1999. But, unable to compete against established foundations, Cherish the Children was forced to close. Why, then, do so many celebrities attempt to start their own charity, when they add to an already fragmented and competitive sector? Whatever the motivation, the stated rationale is often that this new charity can offer something not in the market. However, our research shows these charities compete head-on with other charities. The public sees them as near look-alikes. Charities share supporters with other charities in line with their size. For example, a medium-sized Australian charity will share more of their donors with the Salvation Army or the Red Cross than with Parkinson’s Australia. We see the same pattern when looking at how charities share donors. We surveyed 570 Australians who reported supporting 393 distinct charities. They gave to the Queensland flood relief and established charities, such as Cancer Council Australia, during the 12 months to April 2011. The graph below shows how many people donated to each charity (percentage of donors). The Salvation Army and Red Cross dominate the market. The interactive graphic below shows donors support multiple charities, with sharing largely occurring as predicted, based upon the size of the charity. Each tab shows the percentage of donors each brand shares with other charities. On average, charities share 25% of their donors with the Salvation Army and Red Cross, compared with only 3% of their donors with Oxfam – the smallest charity shown. The last tab shows the predicted level of sharing based on the size of the charity. This allows us to spot any charities that share more than expected. The two largest charities, Salvation Army and Red Cross, share donors with each other at higher levels than the expected level of sharing shown in the last row. Guide Dogs Australia and the RSPCA also share more donors than expected, despite offering different types of services in the community. 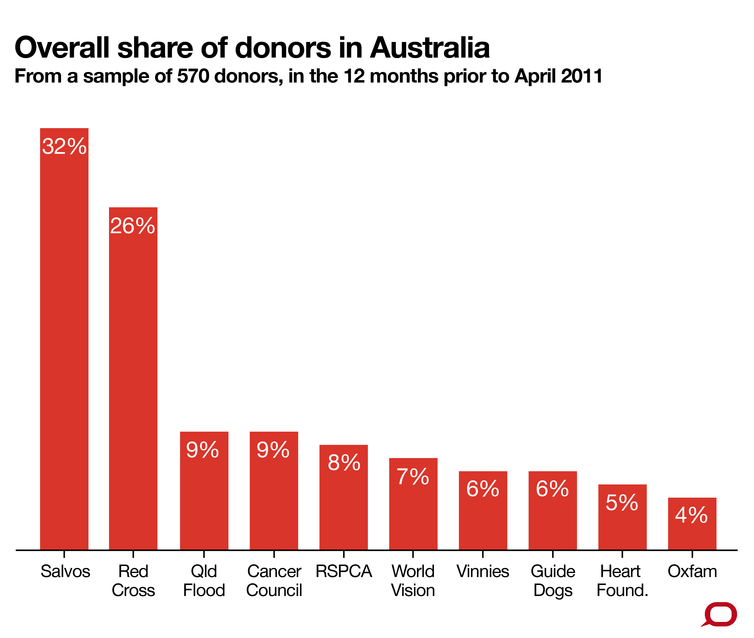 It could be a love of dogs that explains the excess sharing of donors, but these charities also share donors with Cancer Council Australia and other charities that do not feature animals. So, some charities compete a bit more closely with each other. However, if charities were perceived as very different from each other there would be vast differences in donor overlap, or we would expect to see sharing of donors only between certain types of charities. But despite World Vision and Oxfam both helping people overseas, they share many more of their supporters with the Salvation Army – the largest charity – than with each other. The big implication is that all charities compete largely head-on with other charities. Any new charity will win most of its supporters from the biggest charities and some from the smallest. Competition for supporters will be tough. World Vision Australia CEO Tim Costello has called for public figures to support existing charities. He would say that, but celebrities should certainly consider the evidence that they are likely to overestimate the degree to which the marketplace sees their new charity as different or necessary. Charities, like all brands, are in a constant battle for attention – they must win eyeballs more than hearts. This is where a celebrity can help an existing charity. It worked for Pat Rafter, who – despite failing at starting a new charity – continues to make a difference, but through supporting existing charities, including Animals Australia.